Situated in a recently converted Berkshire Barn and separate from the main farmhouse, Hattie and Nick Boden have created a beautifully designed and extremely comfortable barn conversion, offering two double bedrooms both with either an en-suite bathroom or shower room. The barn also has a double height ceiling drawing room for the sole use of the guests. 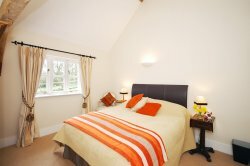 Each room has a colour TV and coffee and tea making facilities. 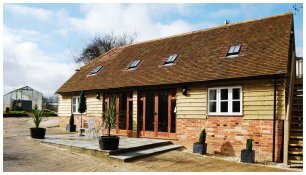 The Bed & Breakfast barn has been inspected by the AA and awarded 4 Stars for its quality. All the food used in making the breakfasts are either produced on the farm or sourced from local producers. Evening meals are available in the village pub which is only a two minute walk from the farmhouse. Please note that we accept payment in cash or cheques but we do not accept credit cards. It must be noted that cars are parked at the guests own risk and the owners of High Street Farm cannot take any responsibility for any damage or theft whilst left on the premises. The owners of High Street Farm will not be liable for any personal loss or injuries to any Bed and Breakfast Guests whilst on their property and guests wandering around the farm do so entirely at their own risk.